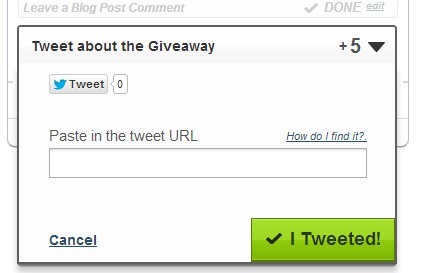 As someone who likes to enter giveaways and likes to hold them sometimes too, I thought it was high time a post was written about how to enter blog giveaways that use Rafflecopter. I do not claim to be the first person to write such a post – I know people such as Di from Superlucky who explain it a damn sight better than I probably will! 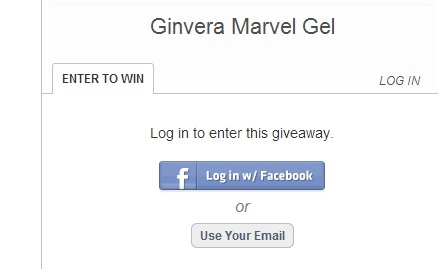 For the purpose of this post, I am going to show you a step by step guide to entering via Rafflecopter and I am using Georgina from Makeup Pixi3‘s post as an example. As you can see, Georgina has clearly stated the prizes available and the rules for entering from the outset. 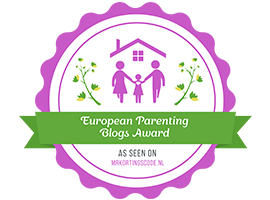 She has stated that all false entries will be removed – this is a problem that besets every blogger, there will always be some people who click, click away on the buttons but don’t actually follow the rules. You will be given the option to log in via Facebook or email. I use Facebook as it is so much quicker! After logging in, you will come to a screen with the mandatory entries. These are assigned a number of ‘points’ each which makes one entry per point. You have to complete these two steps to even be entered into the competition but once completed, this will open the other entries up. 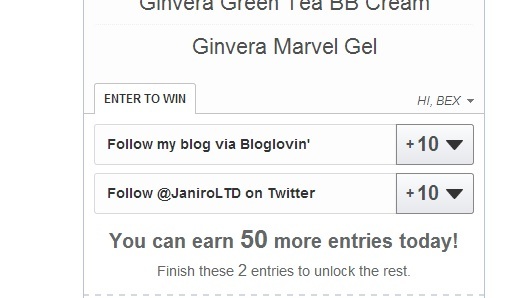 One of the mandatory entries is to follow Georgina’s blog via Bloglovin. 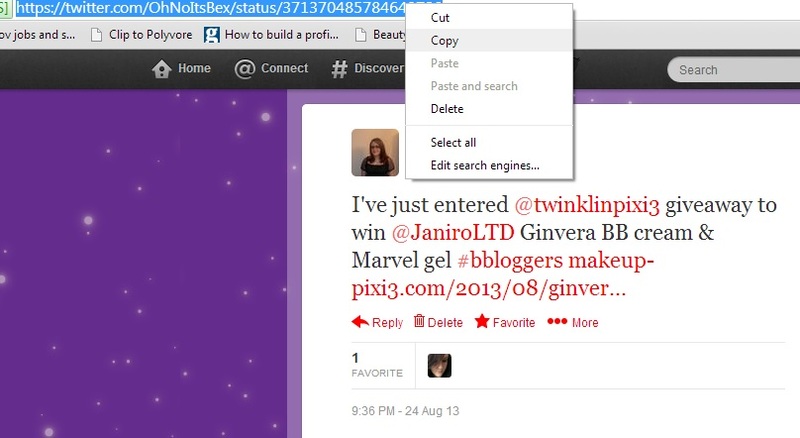 Simply copy & paste the link into your browser and click follow! 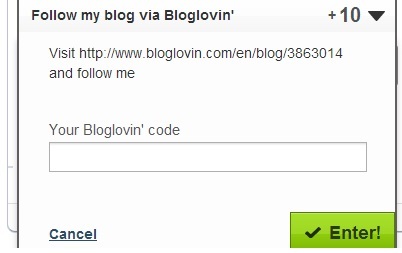 Georgina is asking for your code so she can verify your entry – all you need to do is leave a link to your Bloglovin profile. Simple. 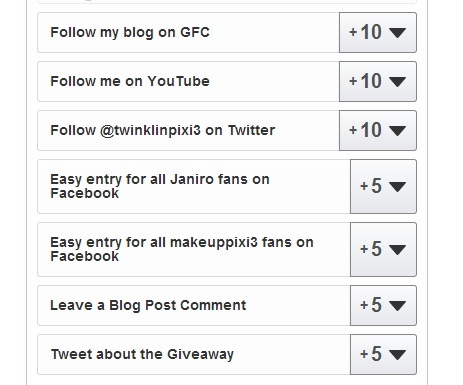 The other mandatory entry was to follow Janiro via Twitter – simply click the follow button if you aren’t following them already and input your Twitter name. Now that the mandatory entries are out of the way, the non mandatory entries are unlocked and you can do as little or as many as you like! I try to do as many as possible; only stopping if I don’t have that specific account. The first few are relatively easy: Follow via GFC which is generally in the bloggers sidebar, subscribe on Youtube (follow the link and hit the subscribe button), follow the blogger on Twitter, like a page or two on Facebook – each one will require a simple click and the inputting of your username for said social media platform. 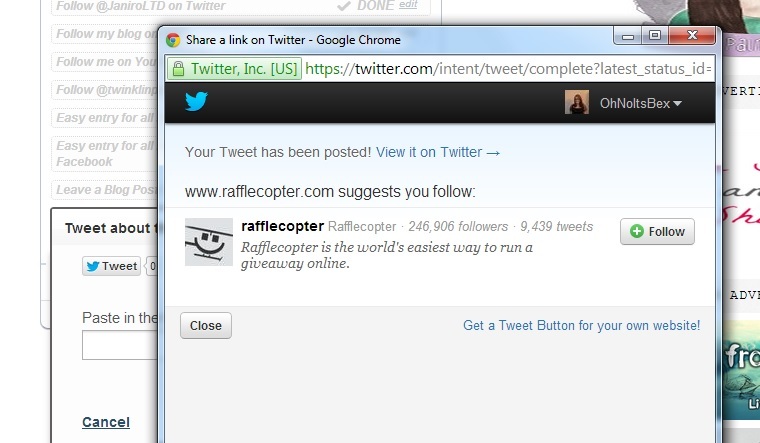 All you need to do is copy the url from your browser and paste it into the Rafflecopter – hey presto, you’re all done! Entering Rafflecopter giveaways is really easy when you know how but I understand that it can be difficult when you first start entering giveaways. If you have any questions, be sure to let me know!